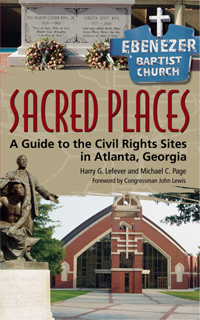 SACRED PLACES is organized around four tours of the important civil rights sites in Atlanta. The first three tours, Auburn Avenue, Atlanta University Center and Surrounding Neighborhood, and Martin Luther King Jr. Drive, provide information about sites located within a single neighborhood or that lie along a street. Tour four identifies and describes The Bridge (a sculpture honoring Congressman John Lewis); the Pickrick Restaurant; the “Atlanta Wall,” where Atlanta mayor Ivan Allen, Jr., approved the erection of two wooden and steel barricades in southwest Atlanta in order to prevent integration; and the gravesite of Ruby Doris Smith Robinson. The book also contains historic and current photographs of the sites as well as directions to the sites. Furthermore, the book provides a brief history of the civil rights movement in Atlanta in the 1950s and 1960s including a chronology of the important civil rights events in Atlanta.